ARE YOUR RECIPES WAITING TO REACH A LARGER AUDIENCE? 5 FREE copies of your book with your order of one hundred or more 8.5 x 11 softcover, coil bound books. Mention the code WEB FOR COOKING to your Publishing Consultant when you place your order. Would your grandmother’s recipes make a wonderful one-of-a-kind gift for the members of your extended family? Could a book of student’s (or teacher’s) favorite recipes be a good fundraiser for your school? Whether you are planning a family cookbook or one for sale to the customers in your restaurant, GCG Publishing can guide you through the process. The value of cookbooks can be seen in any secondhand bookstore where you’ll find notes in the margins that say things like ‘Jimmy’s favorite’ or ‘Christy’s birthday – add more coconut.’ People USE these books. Many kitchens contain an old beloved cookbook passed down from one generation to the next, with the pages stained and the cover hanging on by a thread. Cookbooks are the guidebooks to cultures around the world and throughout time. A book of recipes that were popular in Colonial Williamsburg is still being sold there to this day and books on the latest cooking techniques are selling well in bookstores and culinary gift shops. Shouldn’t your cookbook be out there too? -In your word processing program, do not use tabs to create a two column list of ingredients when you are writing your manuscript. This process does not lend itself to an effective or professional way to layout the pages, especially if you are using an older version of your program. Create the double columns in a program designed for this (InDesign, Quark, etc.) or hire a professional to do the layout. Cookbooks are one genre where the beginner’s attempt at layout almost always is apparent to most readers. 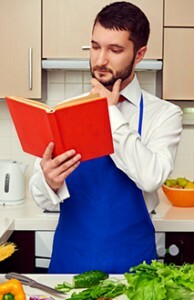 -Have different types of potential readers proof your copy: an experienced cook, a novice cook, and someone strong in grammar and punctuation. Different people will catch different types of errors. The experienced cook will notice incorrect terms, or misspelled ingredients; a novice will be able to tell you if they don’t understand your instructions; and the experienced English major will see errors that involve the language more than the process. Proof, Proof and then Proof again! This is the time you want to make all the ingredients perfect before you put the book in GCG’s publishing oven. -If your budget allows it, full color photos of the finished dish may be the garnish your book needs.